The disposal and treatment of waste can produce emissions of several greenhouse gases (GHGs), which contribute to global climate change. The most significant GHG gas produced from waste is methane. It is released during the breakdown of organic matter in landfills. Other forms of waste disposal also produce GHGs but these are mainly in the form of carbon dioxide (a less powerful GHG). 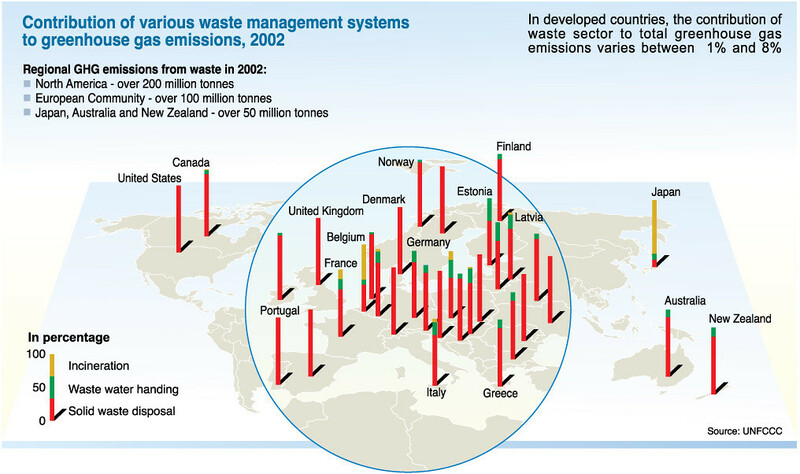 Even the recycling of waste produces some emissions (although these are offset by the reduction in fossil fuels that would be required to obtain new raw materials). Waste prevention and recycling help address global climate change by decreasing the amount of greenhouse gas emissions and saving energy. (Environmental Protection Agency).